The first Boeing P-8A Poseidon for the RAAF has made its first flight, completing the short hop from Renton, where it was built, to Boeing Field where its mission systems equipment is being installed, on May 6. The aircraft, wearing 11 Squadron RAAF markings and the temporary US registration N940DS, took off from Renton at 1:31pm local time, landing at Boeing Field 1hr 53min later, flight tracking website Flightaware shows. It is due to be ferried to Australia “in late 2016 following post-production checks and acceptance”, Defence said in a statement on May 24. P-8s are built on a separate final assembly line at Boeing’s Renton facility in Washington State, where all 737s and their variants are assembled, before they are ferried to nearby Boeing Field, Seattle for mission systems fit-out. 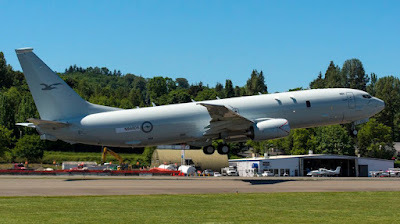 The RAAF is acquiring up to 15 P-8As to replace, along with the unmanned MQ-4C Triton, the AP-3C Orion maritime surveillance aircraft. Approval of the first of those additional tranches of P-8s was subsequently announced by Defence Minister Senator Marise Payne at the RAAF’s Air Power Conference in Canberra in March. “The first of the Poseidons is expected to be delivered late this year and 12 aircraft will be in service by 2022,” Senator Payne told the Air Power Conference.